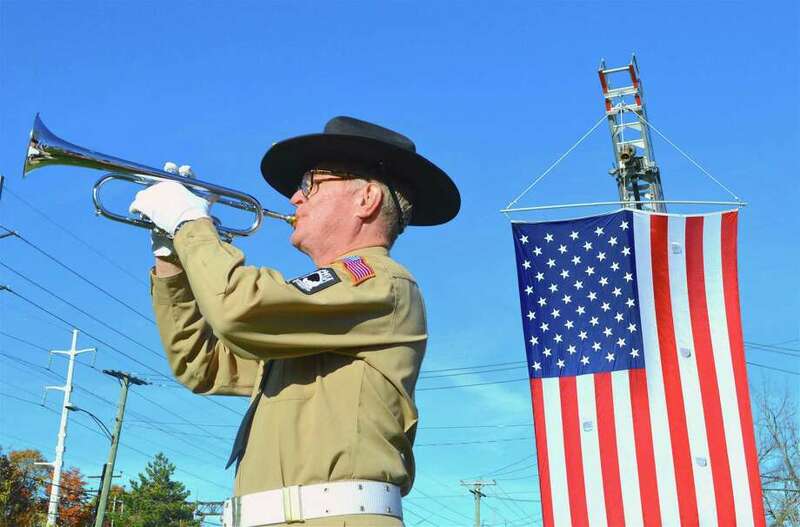 Bugler Tom Dwyer blows taps at the Field of Valor ceremony in Jennings Park in Fairfield, hosted by the Kiwanis Club of Fairfield on Nov. 4. FAIRFIELD — More than 200 symbols of honor, remembrance and service were celebrated Sunday afternoon at Jennings Park when the Kiwanis Club of Fairfield hosted its second annual Field of Valor. “We thought this would be a great project for the community,” said club President Paul Giacalone, marveling at the many flags erected at the corner of the Post and South Benson Roads. He said the number of sponsored flags more than doubled from last year, with proceeds going to Homes for the Brave in Bridgeport, which provides helps and services to area veterans. More than 100 people attended the ceremony, which included a speech from First Selectman Michael Tetreau on current national affairs — in particular the importance of voting in order to change them. “They sacrificed their life so we could live in freedom, not fear of it,” he said, noting too many people declare themselves too busy to vote.